CHECK FACEBOOK FOR EXCLUSIVE DISCOUNTS. COME IN TO SEE OUR NEW PRODUCTS! Welcome to Natural Food Products! Do you realize it takes only hours to empty a grocery store? What would you do for food in a truck strike, storm, illness, unemployment or major emergency situation? Click here to go to our THRIVE page. We are here to help you with those special dietary needs. Our products consist of organic foods, vitamins, minerals, supplements, herbs, personal care products, homeopathic remedies, books and beverages. We have the largest selection of gluten-free products in the area. We also have a large selection of frozen breads, buns, bagels, and tortillas, including flourless Ezekial sprouted grains. We have organic hamburger, chicken, fruits and vegetables available in the freezer. Let us help you with those hard to find items: herbal teas, pure fruit juices, milk substitutes, sugar substitutes, unrefined sugars,raw cider vinegar, sea salt, wheat and gluten free products; vegetarian foods, low salt soups, soy and rice ice cream, healthy cereals and snacks, such as raw nuts, trail mixes, dried fruits. 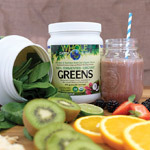 We have vitamins, minerals, essential oils, energy supplements, soy/rice products, diet aids and much more. We are now getting more organic products and hope you will check out our selection. Our friendly staff is always available for questions and will spend time helping you find the information you desire. Call 308-382-0869 to place Special Orders!